First Time offered to the Market - Grand Penthouse with Double River Reach and City Views! Timelessly elegant yet unpretentious and comfortable, this absolute riverfront penthouse defines luxurious inner city living with the perfect north-east aspect in a quiet and peaceful location in Kangaroo Point. Imagine two generous levels, with more than 350 square metres of internal space, wrapped by equally generous 360 degree outdoor balconies that capture staggering vistas of up and down both reaches of the Brisbane River, Story Bridge, Gateway Bridge and city skyline offering the opportunity to enjoy outdoor entertaining year round. That is the reality of this prestigious 'Grand Penthouse' in the award-winning Castlebar Cove complex. Soaring ceilings accentuate an overall sense of abundant space, while the plentiful use of bi-folds on all sides merges indoors and out in a clever floor plan that perfectly suits the temperate Queensland climate. Entertaining is a dream, with stunning views providing a dynamic backdrop and a host of extras that includes electronic blinds, internal lift, built-in outdoor kitchen, Zen gardens and impressive gas fireplace. Immaculate interiors reflect European opulence, but maintain an easygoing and welcoming atmosphere. This includes custom timber cabinetry and parquetry flooring from the open plan living and dining all the way through to the oversized kitchen. Further demonstrating unrivalled beauty and function, this gourmet space also comes complete with stone benches, a butler's pantry and stainless steel Gaggenau appliances (steamer, teppanyaki grill, induction cooktop and wok burner, coffee machine, microwave and convection oven). Ascend the sweeping staircase to access three large bedrooms, all of which feature private balcony access and private ensuites. There is a rumpus/media room on the lower level with built-in wet bar and a lavish home office with timber cabinetry and a private ensuite. Ducted reverse cycle air conditioning, integrated surround sound and a Vaccumaid system further enhance this apartment, but the luxury extends beyond the front doors, with a private heated roof top pool and spa, 16 metre marina berth, private lift foyer and secure access three-car garage with heaps of storage. The technology installed within this apartment has been integrated by award winning audio visual specialists, 'Look & Listen'. Comprising of a multi-room audio and video distribution system with motorized drop down televisions, the lighting control system and AV are all integrated into ergonomically user friendly hand held remote controls. 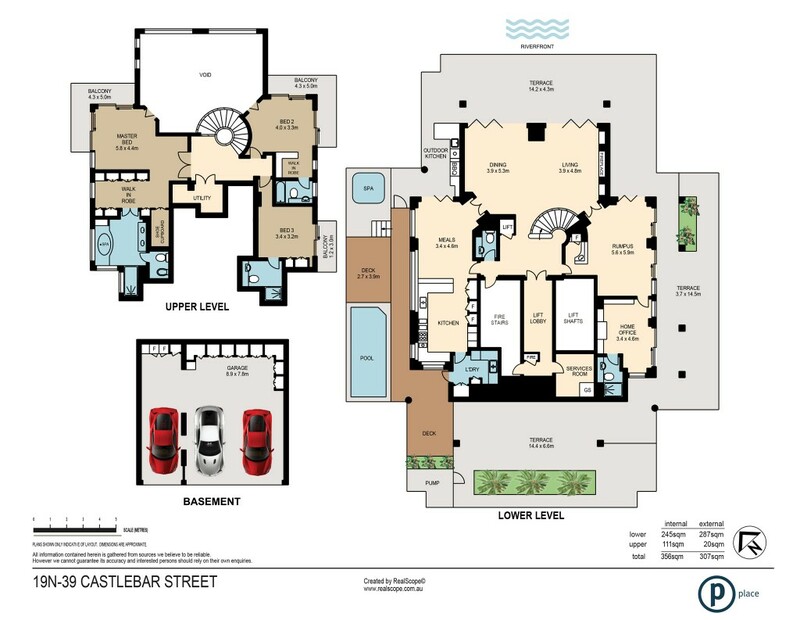 The prestigious Castlebar Cove complex provides a unique and privileged lifestyle that many will envy. This includes access to six-star facilities to rival that of the most lavish hotels across the world. Including a sparkling outdoor pool, additional plunge pools, spa, steam room, sauna, theatrette, conference room and fully equipped gymnasium. Not to mention the spoils of Kangaroo Point. Enjoy a fantastic choice of cafes, bars and restaurants as well as the CBD, all of which is at your doorstep as well as easy access to the Brisbane International and Domestic airports with only 1 traffic light on your journey.